Whaat??!!! (Sorry, I just watched the Psych marathon.) I’ve been nominated for a Golden Quilter Award! These are reader-nominated awards hosted by SewCalGal. Someone nominated me in the “Best Quilt Book Author” category. There’s some mighty powerful company over there… you’ve made my day! To cast your vote in any of these categories, head on over to SewCalGal before the end of the month. Voting ends February 28, 2013. Hope you win. 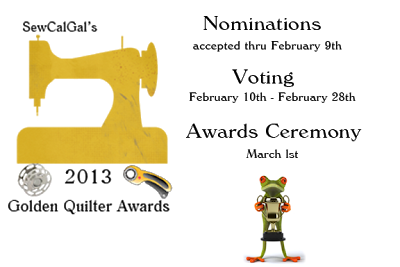 All of your designs are so clean and great for both hand applique and machine. Just so much fun to make. I enjoy your articles soooo much and able to understand your directions, good luck. Congratulations, Kay!! It’s well deserved!